Texas Webmaster is a Pearland, Texas web design and development company specializing in websites for individuals, businesses and nonprofit organizations. Our mission is to custom tailor a web site that best fits each individual client’s needs. 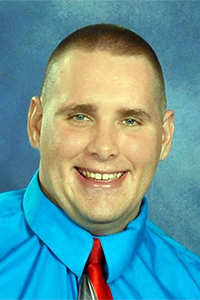 Texas Webmaster was founded and is owned by Adam Cunningham. Adam graduated from University of Houston – Clear Lake where he earned his Bachelor of Science in Computer Information Systems (CIS) in December 2010.The CIS degree primarily focuses on the practical aspects of applications of technology to support organizations while adding value to their offerings. In order to apply technology effectively in this manner, a broad range of subjects are covered, such as communications, business, networking, software design, and mathematics. However, Adam’s first taste of web design came while he was a senior in high school back in 2004. After taking an introduction web design class as an elective, he received his first client while in high school. At that time, it was simple text changes within the client’s web site. However, he quickly moved into designing websites as he was gaining more and more clients. When Adam first started his web design business, he used “Texan Webmaster” as his business name. Reasoning is because he is a true native Texan… born and raised and is currently living in Texas. However, in January 2011, Adam made a bold move in changing his company’s name to the current business name “Texas Webmaster“. 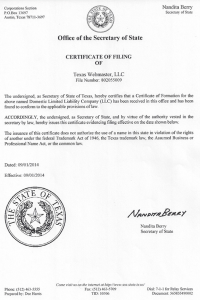 On, May 25, 2011, Texas Webmaster became an accredited business with the Better Business Bureau. Adam took the pledge to always follow the “BBB Code of Business Practices”, which represents standards for business accreditation by the BBB. As to date, there has been no Customer Complaints filed with the BBB and the Texas Webmaster continues to receive an A+ rating from the Better Business Bureau. On September 1, 2014, Texas Webmaster reached another major milestone. 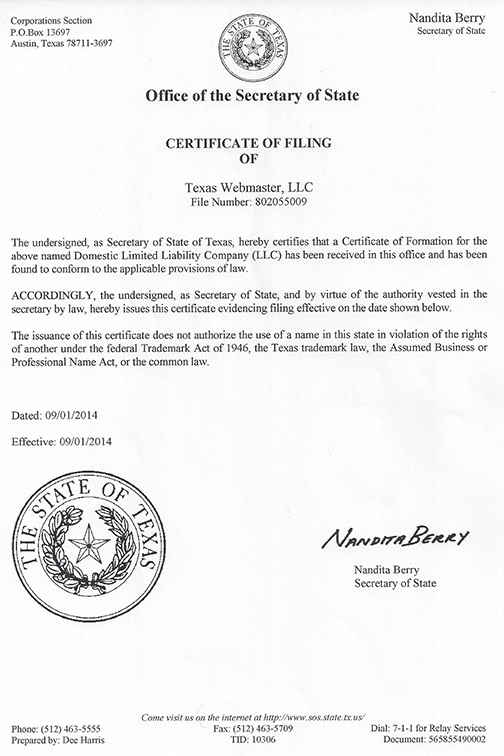 The Secretary of State of Texas approved the application for Texas Webmaster to become Texas Webmaster, LLC. Going from a sole proprietorship company to limited liability company was a major accomplishment in the company’s history. Over the years, the company has grown overall as Adam has built all types of websites ranging from simple and complex websites to membership base websites to even e-commerce websites. His clients range from fishermen, doctors, veterinarians, teachers, music instructors, non-profit organizations and even a millionaire’s yacht. The clientele database has grown to include companies outside the Houston area in Texas plus other states across the US. Texas Webmaster is a one stop shop web design company as Adam offers a full range of web related services, such as custom web design, web site maintenance, web hosting, web consulting, domain name registration, e-commerce solutions, graphic design and search engine optimization. As a small business owner of Texas Webmaster LLC, Adam understands that being in business is tough and sometimes understanding technology is even tougher. He knows that not everyone is tech savvy and he does his best to present the web technology in a way so the average user can understand. His #1 goal is to serve his clientele top notch customer care service. It is what Adam has always done since 2004, and will continue to do in the future.